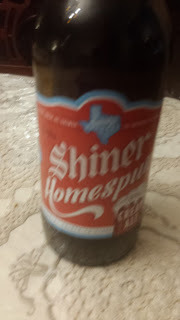 This week's Sunday Night Suds looks at Shiner Homespun Cream Ale. Cream Ales, spawned from the American light lager style, are brewed as an ale though are sometimes finished with a lager yeast or lager beer mixed in. Adjuncts such as corn or rice are used to lighten the body. It is not uncommon for smaller craft brewers to brew all malt Cream Ales. Pale straw to pale gold color. Low hop bittering and some hop aroma though some micros have given the style more of a hop character. Well carbonated and well attenuated. The Shiner Homespun Cream Ale poured a golden yellow, almost like a pilsner. There was little to no hops or bitterness but still a little floral element. The Homespun Cream Ale is 5% abv, but again the alcoholic taste was not present. There was a little foam and lacing which lasted for about half an hour. The beer did have a rich and creamy element and would go well with burgers, hot dogs or other BBQ fare. The Shiner Homespun Cream Ale is under the Kosher Supervision of the Va'ad of Detroit although there is no symbol on the the bottle. To see what the experts on Beer Advocate think about Shiner Homespun Cream Ale click here beeradvocate.com/beer/profile/143/250044.